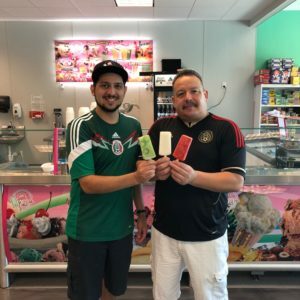 Carlos and Eric are cousins with roots in Guadalajara, Mexico and are the proud owners of Cary’s delicious dessert shop, Vida Dulce. Thank you for being here! 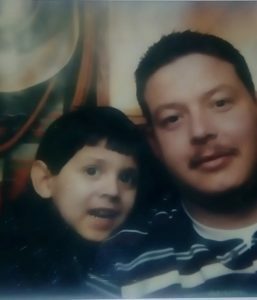 Carlos used to sell popsicles in the streets of Mexico from the age of 10 – about 30 years ago! The mentality to pursue a popsicle business has been there since the beginning. Eventually he went on to open an ice cream shop in Ohio, but the long winter months provided a challenge. With family in North Carolina, maybe the south would be a better home for ice cream and popsicles. Eric is a rare Raleigh native. 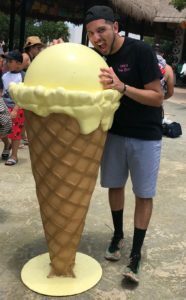 He has always had a sweet tooth and a love for ice cream. Eric comes from a family with a business background, so the thought of owning any kind of business has always been a dream. The concept of an ice cream business has been tested and proved in Guadalajara, Mexico – his grandpa, aunts, and cousins on his mother’s side are all in the business. Fast forward to 2017. Carlos was looking to move south to find a better place for his family to live. Eric was a master mechanic with a well respected car brand. Both knew there were bigger goals ahead to go after! They joined forces and Vida Dulce was created! Eric was able to visit Guadalajara to learn how it’s all done and bring back a piece of Mexico to home in North Carolina. Vida Dulce opened on May 2nd, 2018 and it’s been a Sweet Life ever since. Vida Dulce means “Sweet Life” in English. The goal is to bring people together from all cultures and backgrounds. There are so many options of popsicles, ice cream, and other treats that there is something for everyone. Vida Dulce is the perfect place for date night, a family outing, catching up with new and old friends, and celebrating life’s moments. We would love to serve you so you can Live La Vida Dulce!